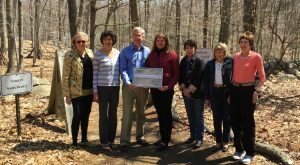 On Earth Day, at the head of the Earthplace trails system, the Westport Woman’s Club’s Community Services chair, Nancy Saipe, presented its annual $5,000 Ruegg Grant to Tony McDowell, EarthPlace executive director and Lisa Shufro, Trustee and Grounds chair. Also presenting were WWC president, Dorothy Curran, and Jo Fuchs-Luscombe, Mary Lee Clayton, and Arlene Thrope. According to McDowell, for the 17,000 people who visit EarthPlace every year, the organization plans to use the $5,000 grant to revitalize and remap their sanctuary trails, natural habitats, major vegetation areas, buildings, streams and property boundaries, then create and distribute accurate maps to the public. As Westport’s second largest open space parcel (following Sherwood Island State Park), Earthplace provides free public access to several miles of trail routes including a universal access one, suitable for wheelchairs and strollers. Nature lovers and trail walkers of all ages will enjoy the upgraded trails and maps for years to come. The Westport Woman’s Club, established in 1907, is a non-profit social philanthropic organization dedicated to volunteerism and the raising of funds for charitable purposes. Capital for its Ruegg Grant was provided by a 1995 endowment bequest by member Lea Ruegg, with the stipulation that the WWC annually award the grant to a deserving non-profit or service organization for an important initiative in the arts, education or health and safety. Past beneficiaries include the Westport Police Department, Susan G. Komen for the Cure Connecticut, Hall-Brooke Behavioral Health Services, Nursing and Home Care, Westport Center for Senior Activities, Interfaith Housing Association, Mercy Learning Center, Toquet Hall, Clasp Homes, Westport Weston Family Y, Wakeman Town Farm and ITN Coastal CT.